Dr. Trenace Richardson is a phenomenal woman who is in the business of helping other women connect with their inner selves and live their best lives. She is an author, educator, nationally recognized speaker, minister, wife, and mother. Richardson holds a Master of Divinity degree from Howard University and a doctorate degree in higher education administration from The George Washington University. She currently serves as the dean of faculty at Strayer University and worship leader at Lifepoint Church in Waldorf, Maryland. After suffering an emotional breakdown several years ago, Richardson realized it was time to do some real work on herself—she had to free herself from the expectations of others and remove the self-described “mask” she wore for far too long. That work consisted of serious self-examination as well as emotional and spiritual work. And while doing that work she was inspired to help other women do the same. 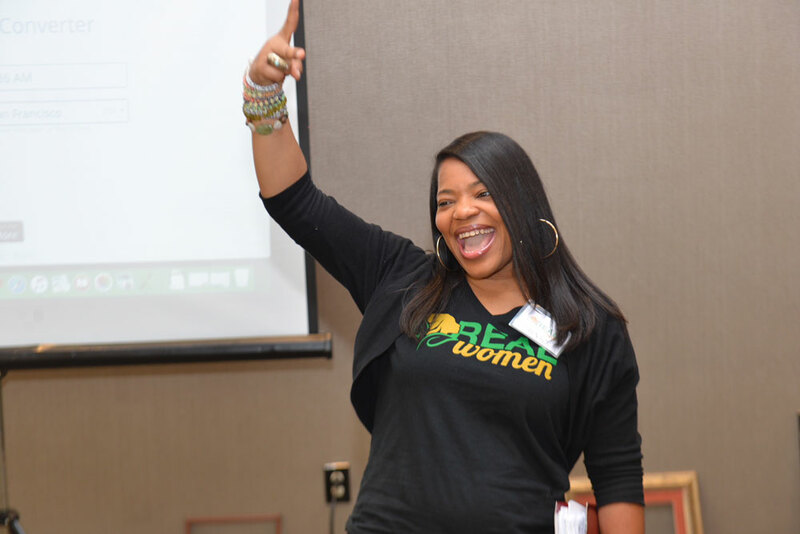 In 2012, Richardson founded REAL Women, an organization in which women have a safe space to do real work on themselves. And she has since been instrumental in transforming the lives of countless women. ESME recently spoke with Richardson about how she got “real” with herself, the mission of her organization, and how women can begin the process of becoming their most authentic selves. Q: When did you create REAL Women, and what inspired you to create such an organization? A: REAL Women was created out of my own brokenness. I have always been a leader in education and ministry, and because of that, people constantly relied on and had expectations of me. They assumed that I was fine all the time and very rarely asked if I was OK or needed anything. I would wear this “mask” as if everything was fine with me even when it wasn’t. At the time, my marriage was suffering because I was making my work the priority over my family. Soon after, I had a breakdown. Following my breakdown, I kept hearing of and moving toward other women going through the same thing. It came to me that women needed to have a safe space in which they could do real work on themselves. In 2012, I conducted my first REAL Women session with a woman via conference call, and in 2013, I had my first in-person session with a woman. My mission was to create a place in which women can work on themselves in a safe and vulnerable space and just be themselves. Q: Your tagline includes women doing “real work” on themselves. What does women doing “real work” on themselves look like? A: I’m going to first talk about what real work is not. We may be doing professional development or relationship work to improve our marriage, but that is not the real work. The real work we do is soul work and personal development. Figuring out our purpose or who we are as women is the real work. And getting to that point takes emotional and spiritual work—soul work. And because life is often too busy and the noise is too loud, we don’t take the time to do the work. But in REAL Women, you’re doing that work and you’re doing it with other women. There are certain things you are not going to share with a friend or family member. And in a religious context, there are boundaries in that relationship, too. But hearing other women share experiences similar to yours creates an amazing energy. We are not afraid to be vulnerable in REAL Women because it is a safe, nonjudgmental space where you can take what you need and soak it all in. Q: What was the defining moment in your own life when you had to do real work, and how did you navigate doing the work? A: I was living a double life. On the outside, I was an overachiever, but inside, I was suffering. I had to get to the point where I was integrating all of me into my life. As one of our REAL Women facilitators says, I had to come to realize that I can be this and that as opposed to this or that. When I reject my flaws, I am rejecting me. I was not taking time to think, reflect, and refresh myself. I was not appreciating that I had been given a whole life to live. I had to fall apart in order to put myself back together again. I wasn’t happy with me. I had to slow down and allow God to continue to work on me. Q: Why do you think a spiritual practice is especially important in the life of women, especially in the lives of Solo Moms? A: There is a difference between religion and spirituality. You must have a spiritual practice that tunes you in to yourself. We are more than just flesh and blood. You have to get to know the wonderment of the world—whether it be out in nature or connecting with others. You also have to help other people. We are our best selves when we do something for people in need. Whether through prayer or meditation, quiet time is a settling of myself and my soul. Everyone can start there to begin to hear themselves. Q: How do you think women can build stronger connections with and support one another? A: We as women have to learn—and it is a discipline and practice—not to compare ourselves to one another. It starts with the lens in which we see each other. I can see another woman as an enemy or a “frenemy,” or I can see her as me. We need to be able to look at one another and say, “You are me.” For example, you may not have lost a husband, but you have lost someone, whether it be a sister, mother, or friend. You know loss. And that is where we can begin to relate. Q: How can women learn to remove their “masks,” live more authentic lives, and free themselves from the imprisonment of negative self-talk? A: You have to take a step and dare to share. It could be with someone you are comfortable talking to; it could be in a journal or to a counselor. You must begin to release. You cannot live on your own in silence. Women need a safe space in which they can share. You can be a virtual member of REAL Women, no matter where you live. Or you can host a live sister circle in your area. All you need is five women in a room, and REAL Women will come to you in your city. If you are not careful, your safety net of silence can become your prison. In REAL Women, you can be vulnerable and release guilt, shame, and fear in a safe space. Q: You are the mother of a son and daughter. What are some of the critical lessons we need to teach our sons and daughters, especially in this day and age, to plant seeds of positive self-perception and strong self-esteem? A: Look, for example, at what Marika [Lindholm, founder of ESME] is doing. There is such a need to help moms and single parents. I want to appreciate and celebrate ESME for what it is doing to empower mothers. We have started the process of establishing REAL Women Young Adults, and we are also going to have REAL Girls. We have to teach our young people there are no failures—you either win or learn. All of our successes are built on expectations, and that can burden young people. Every night, my eight-year-old son must give me three “I am” statements (for example, “I am smart,” “I am funny,” “I am strong”). We must empower our young people to love who they are, not who we want them to be. I homeschool my son because he started comparing himself to other students. He needed to understand that what he values and loves to do, and his strengths are what we are going to focus on. We must affirm our children. Q: On your site, you encourage women to focus more on the journey and less on the destination. How can we as women begin to do that, especially as Solo Moms? A: I see “there” as a moving target—the house we want, the man we want, the career we want. And as soon as we get close to the target, it moves again. “There” is not real. “There” is here, which is where we are supposed to be and bask in. If we always focus on “there,” we will never appreciate where we are in our lives now. There is so much wonder in the journey. We shouldn’t obsess over a destination. Q: How can women become part of your REAL Women community? A: Subscribe to our newsletter, which makes you a virtual member, or contact us on the bottom of our homepage at www.realwomenrock.org. On Facebook, we are @REALWomenRock, and on Twitter and Instagram @REALWomenRock2. You can also become an ALL Access member, which allows you to come to our in-person sessions free of charge. If you want us to come to you, email us at info@realwomenrock.org. Get five to 10 women in a room, and we will come with our trained facilitators to conduct a sister circle, or you can come to one of our established sister circles free of charge for the first time. And please sign up for and come to our upcoming REAL Women Winter Intensive on December 8 and 9 in Alexandria, Virginia.